Never Enough Nails: Let's Go Back to Spring with Lynnderella! China Glaze 108 Degrees and Lynnderella Candy Blossom were purchased by me. All opinions are my own honest thoughts. Let's take a quick break from summer heatwaves and fall collections, and go back in time to spring, when the flowers were newly blooming and the air was fresh and cool. I finally wore the remaining two polishes from the Lynnderella Everything's Coming Up Neon spring collection and they're gorgeous! According to Lynnderella, Lynnderella Candy Blossom has "pastel pink satin, neon pink and green, white as well as yellow glitters in a clear pink-shimmered base". You can see the base really has a ton of gorgeous shimmer! I love the addition of green and yellow glitters with the pink, it's so fresh and springy! This is two dabbed coats of Candy Blossom over China Glaze 108 Degrees. It was very easy to dab on and had plenty of glitter. I did not have to do any fishing around for the glitter, it came out quite readily. 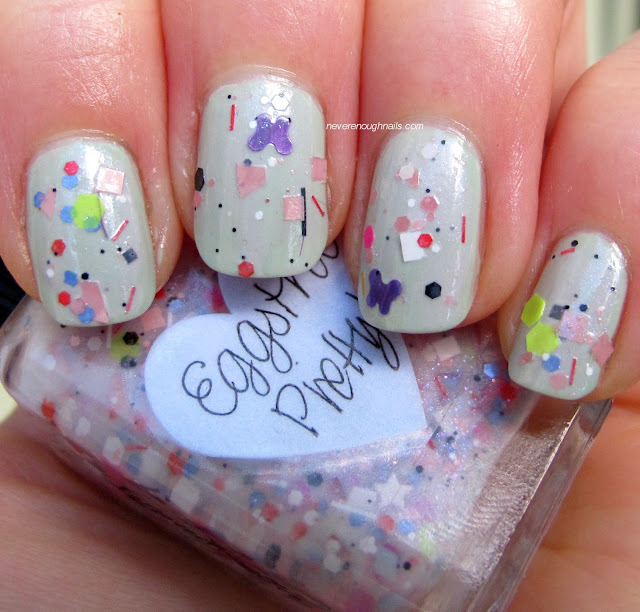 Color: three coats Zoya Neely, two coats Lynnderella Eggstra Pretty! Zoya Neely was sent for review. Lynnderella Eggstra Pretty! was purchased by me. All opinions are my own honest thoughts. I actually did this mani on Friday July 19 as my mint mani for Talia. Talia Joy Castellano was an amazing YouTube make-up guru who lost her battle with cancer at the young age of 13. She was an inspiration to everyone in the make-up community and beyond. Lynnderella Eggstra Pretty! is a mix of "scattered assorted neon, pastel satin and matte glitters in a soft, translucent lavender-white base with subtle lilac shimmer". The sheer lavender-white base means that this polish really works best over a pastel or soft white base. I really really love the purple butterflies in this polish! I didn't realize they were in the polish, and it turned out to be so perfect for a mani memorializing an uplifting person like Talia! This is two dabbed and pushed coats of Eggstra Pretty! over three coats of Zoya Neely. I had to spread the glitter around a bit and I felt like the application on this one wasn't as easy as some other Lynns. It wasn't bad, it just wasn't super easy. The butterflies did come out all by themselves though! No fishing for them! Lynnderella polishes are available at Lynnderella.com, Norway Nails, and Glitter Connect. Zoya Neely was sent for review. 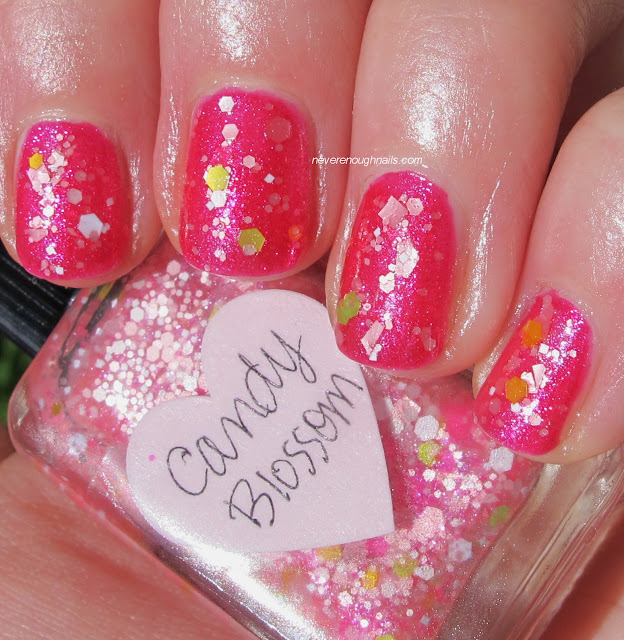 China Glaze 108 Degrees, Lynnderella Candy Blossom and Lynnderella Eggstra Pretty! were purchased by me. All opinions are my own honest thoughts. 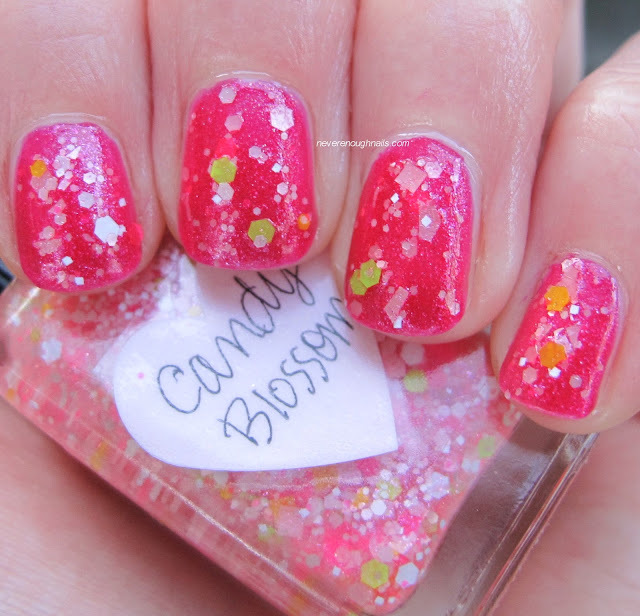 Candy Blossom is super pretty!!! 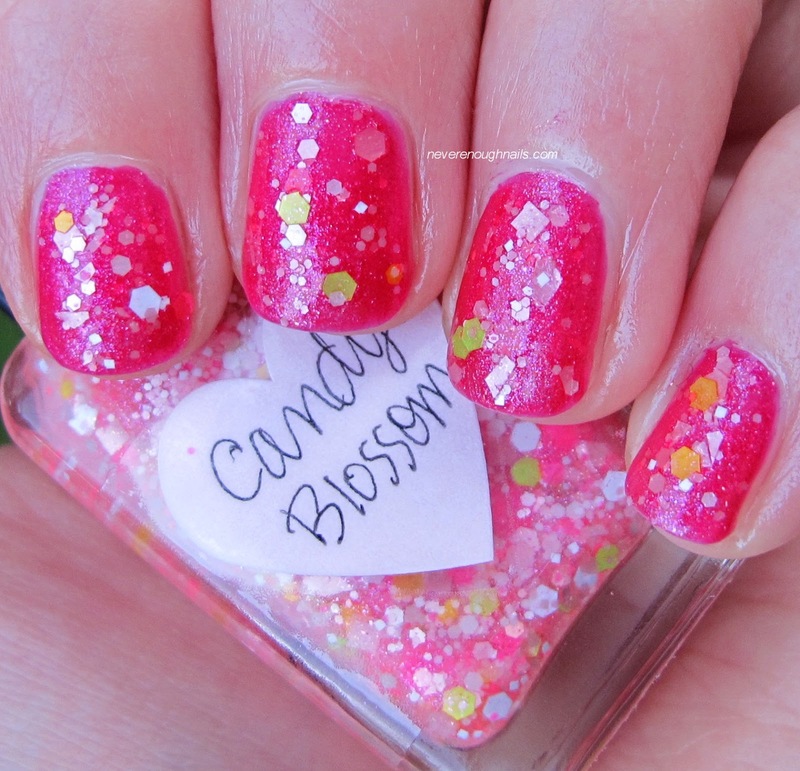 That was one of my favorite manis recently Marisa!